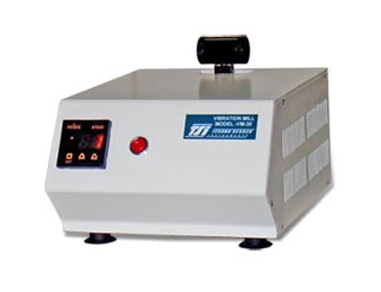 Vibration Mill suitable for mixing of sample & KBr, using S S Ball. The mixing & blending of KBr with sample can be easily done using the Vibration Mill. The sample is contained in stainless Steel capsule and reduced to fine mixture of sample and KBr by the pulverising action of grinding balls. It is fitted with a 30 min adjustable timer for Auto Stop. Timer : Digital upto 30 minutes adjustable in steps of minute. This vibration mill is particularly suitable for DST user where in the sample quantity is too small and sample homogeneity therefore is very crucial. For this application KBr is taken in good quantity ( say 1 gm) and sample also proportionally on the higher side ( say 10 to 20 mg) . This mixture when used in the Vibration mill gets homogeneously mixed. A small portion of this is taken for analysis with DST.